How has your summer been going? Have you knocked off many things on your never-ending to-do list or DIY list? I’ve been able to do a little crafting for items that have been on my list or jumped to the top of my never ending list overnight. As a blogger I sometimes have a hard time taking photographs… Meaning, the background is never what I want. I always find myself moving things around my counter or on my kitchen table to get the right shot. During these warmer months I am fortunate that I can head out into my backyard and take pictures on my picnic table without too much worry of obstructions in the background… Grass isn’t bad as background I think. It’s especially difficult when I take pictures of some of my jewelry pieces or yarn projects… I have to wait until the light is just right (which is still usually in my kitchen) and set up a snack table with a white foam board as a backdrop to get the “right” shot. But, sometimes you want a little more color and personality than just a plain white board and I personally think that the white background isn’t always complementary. So, I did a little DIYing and created some backdrops myself. Now I know that you can purchase more sophisticated and professional looking one’s online, but, I wasn’t 100% sure what I wanted and I am one who believes that if I can do something myself instead of paying someone else to do it then I might as well do it. Also, I just love creating things. It’s one of the ways I learn new things and get ideas for other things. 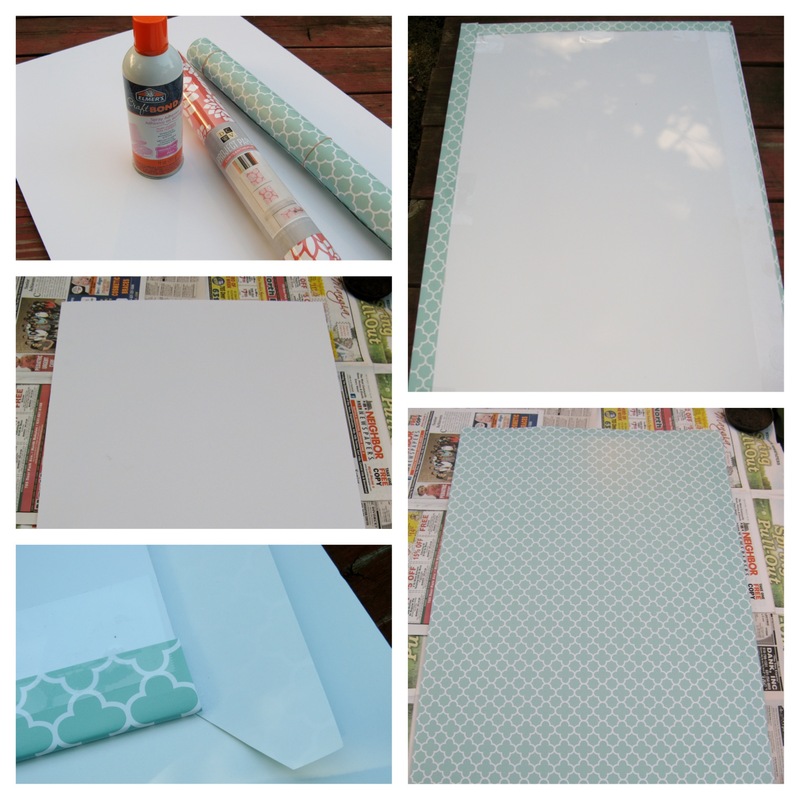 So, one day while I was at my local Jo-Ann’s I picked up project paper in two different patterns – quatrefoil and chrysanthemum – and decided to give this DIY project a go. I began by cutting a piece of the decorative paper bigger than my foam board. After covering my work surface with newspaper I sprayed the foam board with adhesive spray and carefully placed the paper on top of it, smoothing out any bumps. After letting the glue dry overnight, the following day I folded the excess paper around the edges and taped them to the back. To ensure that I would get smooth corners I cut the paper on an angle there before folding it over. 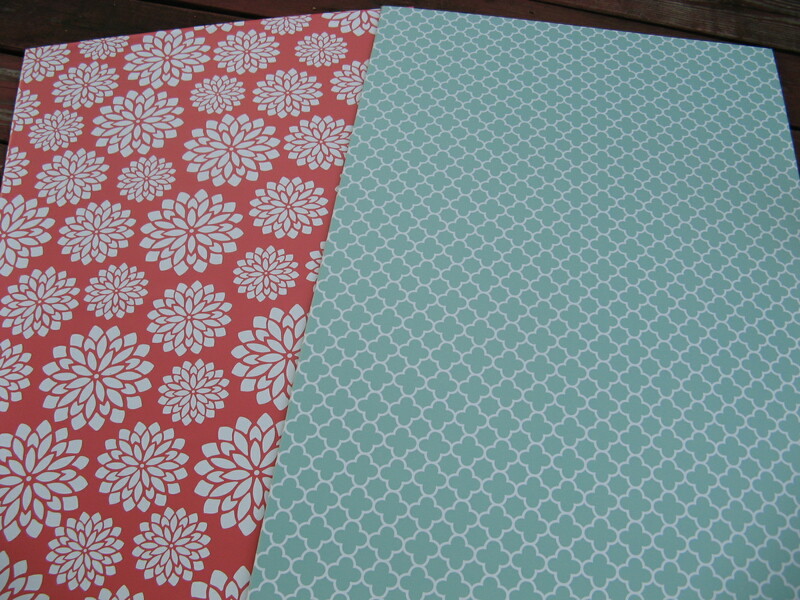 And now I have two colorful and decorative backdrops than I can use for an array of things! 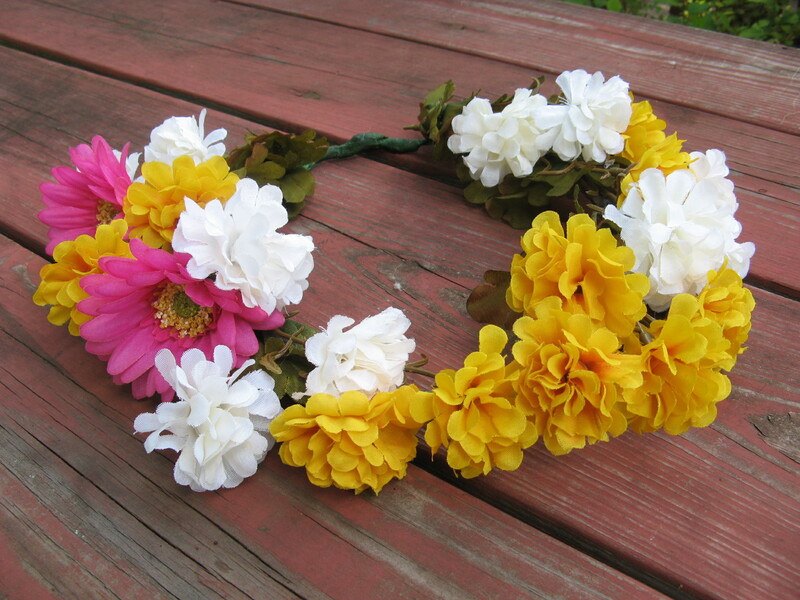 Next up… Flower Crowns. Last year I went to the Renaissance Faire in upstate New York – I had wanted to go for years. I truthfully had no idea what to expect, all I knew was that the description made it sound like fun, and it was. So much so that I went again this year. While there last year I was tempted to buy a flower crown, not sure what stopped me. Oh yeah, I know, the fact that I would never wear it. I won’t even put a hat on my head when it’s freezing cold outside! This year my friends daughters were coming along for the fun; although only the eldest one ended up going. 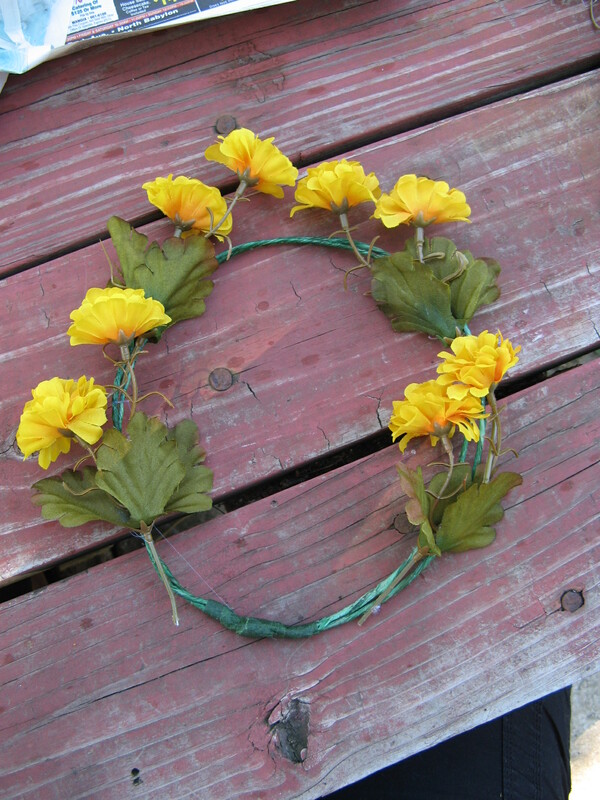 So I decided to make them flower crowns to wear! 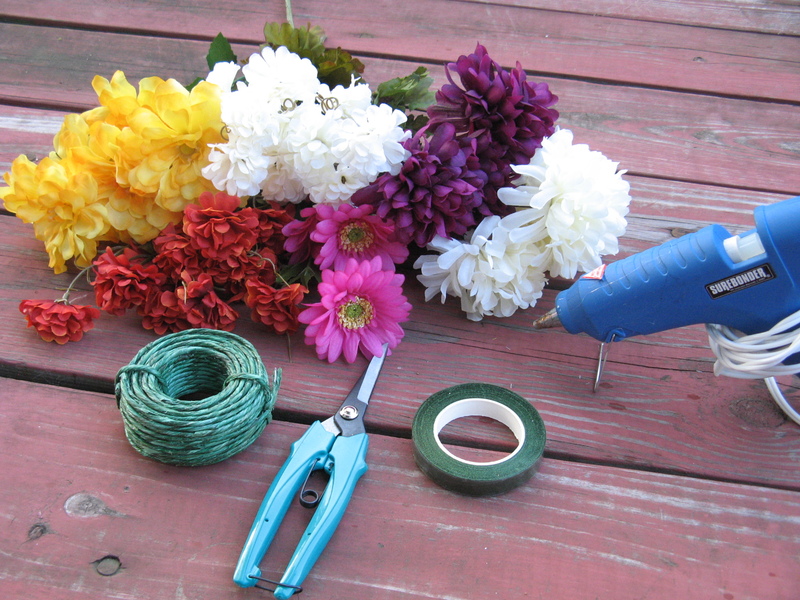 Supplies needed are silk flowers, floral wire and tape, wire shears and a hot glue gun. After measuring the girls’ heads with the floral wire I wrapped the ends with the tape and began gluing flowers to it. 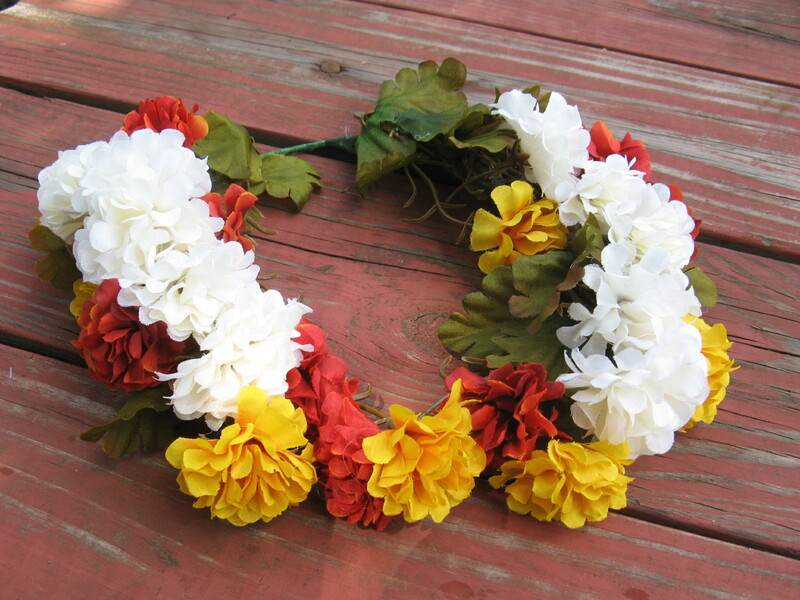 And it wasn’t long before I had completed both flower crowns. And finally, my knitting project, which at the moment is a WIP – a work in progress. 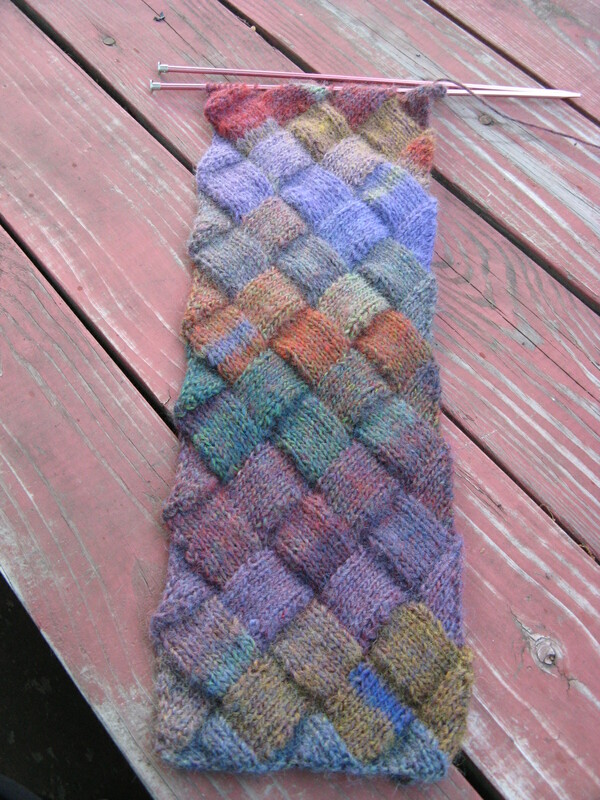 I finally taught myself Entrelac and I am quite excited about it (Hmmm… maybe I need to get out more!) Anyhoo… It’s been on my to-do list for years and I just never got around to it, but, I made it a point to hunker down this summer and learn. And thanks to YouTube the pattern didn’t seem as confusing as I initially thought. Oh, and I am sure you may be wondering… Entrelac is an interlace knitting pattern that creates a textured diamond pattern. Here’s a close-up shot of it… While it may look as though it’s different strips of yarn woven together it’s the complete opposite, the entire scarf is knitted in one piece with a series of triangles and squares. 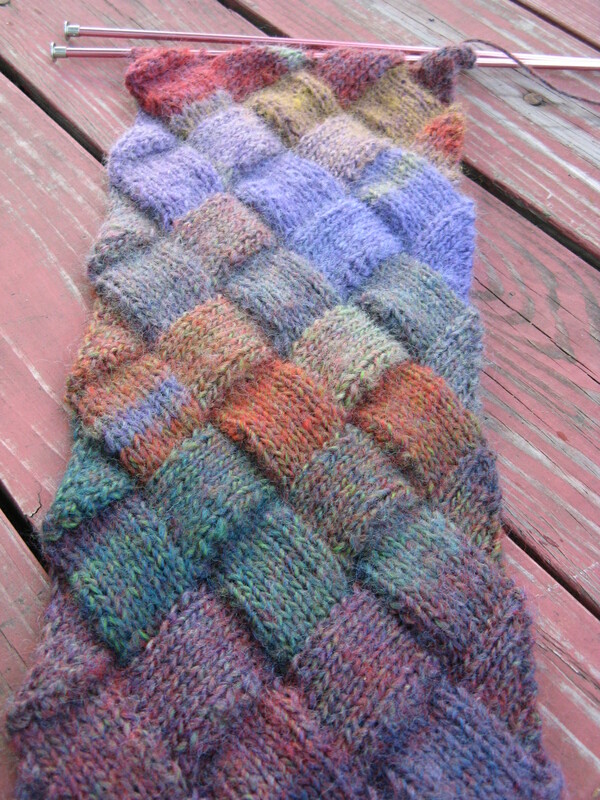 It sort of reminds me of a basketweave pattern, but, on an angle. Using yarn such as this one – Lion Brand’s Amazing – really helps one to appreciate the pattern because of the color variations. And that’s been my summer thus far on a crafting perspective!